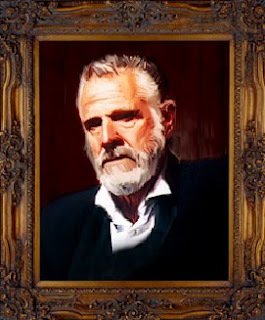 Is the Most Interesting Man in the World a More Interesting Man, than Joe Camel is an Interesting Camel? I could really go either way with this one as they both have the obvious merits. 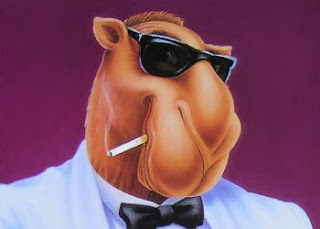 However, I've met and heard of a lot of men I thought were interesting, with TMIMITW being chief among them, but Joe Camel is the ONLY camel I've ever found interesting. He's a good four standard deviations above the mean for camel interestingness, whereas TMIMITW is probably closer to two or three for man interestingness. Plus Joe Camel was banned. What's cooler than being so dangerous that you're banned? Plus he was banned for tempting underage kids to smoke. You know who else encouraged underage drug use? Wooderson from Dazed and Confused- the coolest character in the whole damn movie. Put, to play Beelzebub's apologist (that would be a sweet name for a punk band, btw), you have to give TMIMITW credit for, ostensibly playing by the rules the whole time yet managing to stay so goddamn interesting. I guess it really comes down to whether or not you like the rebel or the straight man. Dylan McKay or Brandon Walsh? Frank Sinatra or Dean Martin? Angelina Jolie or Jennifer Aniston? Pee Wee Herman or the ex con he picked up who has got a real bad temper and cut the tag off of a mattress?